Hurricane Hector remains a powerful Category 4 storm as it continues moving westward across the Central Pacific. The latest forecast at 5 a.m. Monday said the hurricane intensified slightly, packing maximum sustained winds of 145 mph with higher gusts. The storm was moving west at 15 mph. Hawaii News Now. 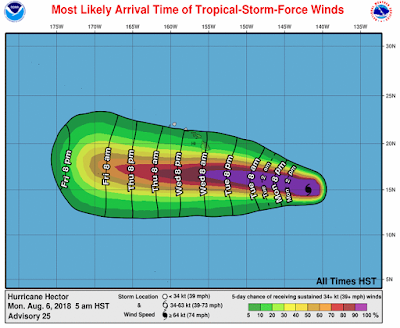 Hurricane Hector gained in strength overnight as it continues its march westward across the Central Pacific. 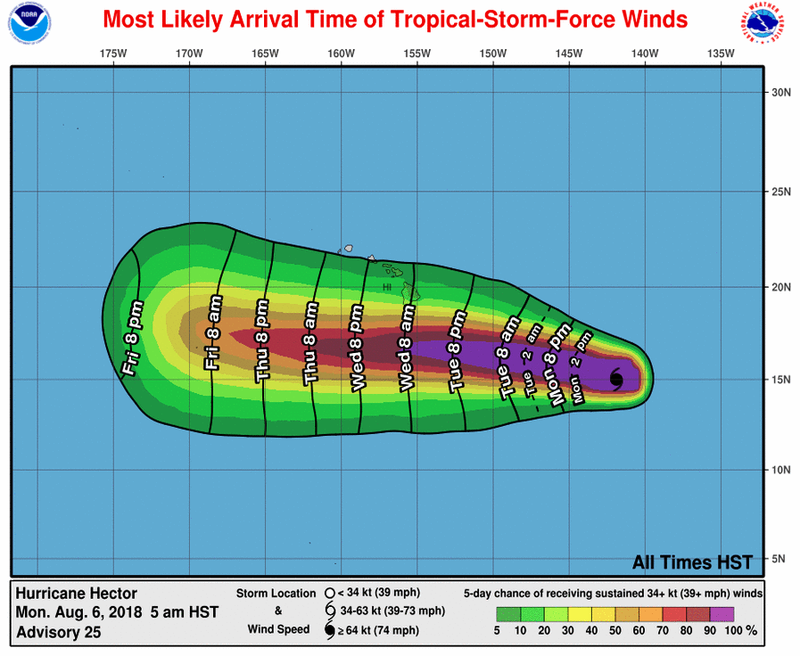 With maximum sustained winds of 145 mph, up 5 mph from Sunday night, Hector’s center was located about 930 miles east-southeast from Hilo as of 5 a.m. today and moving west at 15 mph, according to the National Weather Service. Star-Advertiser. NextEra deal helped shape Democratic primary. It wasn’t obvious at the time, but the fight two years ago over NextEra Energy Inc.’s effort to buy out the state’s largest utility was a pivotal event that instigated this year’s hard-fought Democratic primary for governor. Star-Advertiser. Do New Pro-Hanabusa Ads Violate State Campaign Rules? The independent PAC, Defend Hawaii Now, has not disclosed any financial information with the state. Civil Beat. Ballot-counting machines tested in latest phase of primary election preparations. Hawaii's primary election is just a week away, and on Saturday, tests were conducted to make sure the votes are counted correctly. KHON2. Medley of Democrats compete for Hawaii U.S. House seat. The seat representing Honolulu in Congress is open for anyone’s taking, as the incumbent, U.S. Rep. Colleen Hanabusa, runs for governor instead of re-election. Associated Press. No Democratic Party Poll Watchers For Primary. The party’s state chair says it’s too late to train volunteers to keep an eye on poll workers in Saturday’s election. Civil Beat. Local Unions Watch Lawsuits in Wake of Janus Decision. The Hawaii Government Employees Association is closely watching the outcome of lawsuits filed on the mainland by some groups looking to claim back dues following the recent decision by the US Supreme Court. That ruling, tied to first amendment arguments, allows public employees to opt out of paying union dues altogether. Hawaii Public Radio. Hawaii’s New Police Shootings Review Board Finally Has Its First Case. But it’s loaded with former police, prosecutors and judges, raising questions about whether it’s just a rubber stamp. Civil Beat. The number of Hawaii reef fish caught by fishermen with commercial marine licenses has plummeted 80 percent since an October court order slowed the industry; meanwhile, the future of reef fish collecting for aquariums is likely to be determined by a review process that begins Wednesday. Star-Advertiser. The state appears to be getting ready to appeal last month’s 9th U.S. Circuit Court of Appeals opinion striking down the portion of Hawaii’s firearm licensing law that effectively prohibits carrying a firearm in public. Star-Advertiser. The Hawaii Department of Transportation reports that the Airports Division’s bond rating was upgraded by S&P Global Ratings to AA- from A+ in advance of its upcoming bond issuance. Big Island Now. Why College Now Starts In High School For So Many Hawaii Kids. As the number of college-level courses offered in high school soars, state officials hope it will lead to a better educated workforce in Hawaii. Civil Beat. Hawaiian Electric Industries Inc.’s earnings jumped 19.1 percent in the second quarter as the holding company’s utilities and its bank subsidiary posted strong results. Star-Advertiser. Nasty Tactics Distract From Issues In North Shore City Council Race. Four candidates are vying for an open seat in a district struggling with traffic and the loss of affordable housing to short-term vacation rentals. Civil Beat. A four-day event aimed at helping Hawaii's community leaders prepare for natural disasters is set to kick off at the Hawaii Convention Center on Monday. Hawaii News Now. Hawaii to test alternative fuel technologies at Honolulu airport. Pacific Business News. A year-over-year comparison of homes sales on Oahu by Honolulu real estate firm Locations found that prices rose by a greater percentage for condominiums than for single-family homes during the 12-month period that ended on Tuesday. Pacific Business News. Scientists, authorities still vigilant despite volcanic lull. Hawaiian Volcano Observatory scientists confirmed Sunday that rates of seismicity and summit deformation have decreased, as has lava output from fissure 8. Tribune-Herald. More than a thousand people, including police officers and first responders from across Hawaii and beyond, paid their final respects Saturday to fallen Hawaii Police Department Officer Bronson Kaliloa. Tribune-Herald. Thousands gather to honor fallen Hawaii County police officer Bronson Kaliloa. KHON2. Officials say the Hawaii National Guard has experienced delays in paying members deployed for duties related to the flooding on Kauai and the lava flows on the Big Island, causing financial burdens for families. Associated Press. Teachers, students face a new normal in lava-ravaged areas. Star-Advertiser. For the second mayoral election in a row, seven candidates have tossed their hat into the ring, and only two will emerge after the primary election Aug. 11. Maui News. A performance audit of the county Department of Liquor Control has been extended to Sept. 21, Maui County Council Member Yuki Lei Sugimura announced Saturday. Maui News. Maui High School’s staff and teachers are doing their best to handle a record-breaking student population of more than 2,000 at the Kahului campus. Maui News. Roundup found in 1/3 of Kauai honey on store shelves. re bringing more than just pollen back into their hives when they return from foraging, according to a recently released, peer- reviewed study published by Kauai scientists. Garden Island. The County of Kauai is launching the West Kauai Community Plan to update two outdated regional development plans: the Hanapepe-Eleele Development Plan (1974) and the Waimea-Kekaha Development Plan (1978). Garden Island.